A design sprint is a process for solving a specific problem and uses a 360 view of your organization. It was developed at Google Ventures to quickly design, prototype, and test ideas. With input from 5-7 members of your organization, a facilitator – your Sprint Master – helps you address a specific challenge within the course of a week. Since sprints last up to five consecutive days, they take time away from day-to-day jobs, but the up front investment keeps you from spending resources on the wrong things. You’ll have confidence that your time and effort matters. The traditional design sprint occurs over five days. If you decide a five-day sprint is not right for you after reading the below, consider a brand sprint or a shorter remote sprint. 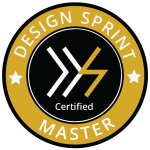 What use a Sprint Master/facilitator? A facilitator is invested in your organization making progress but is not invested in a specific idea. This keeps the facilitator focused on the process. What work with Tina Arnoldi? Tina has worked with businesses and nonprofits, ran a Google funded startup matching tech volunteers and nonprofits and worked as a consultant since 2011. She is part of the Google Expert Community and participated in a Sprint Master Academy at Google in Mountain View. She is a Certified Sprint Master. As a trained therapist, she brings empathy and active listening skills to her sprint. Tina also describes herself as Type A who has wasted too much time in meetings with no real purpose. This is why she runs sprints with groups that are motivated to get something done – such as testing messaging, clarifying mission, or developing an app. You can set up a free 15-minute phone consultation to ask questions about the process. You may also want to view the Design Sprint Inquiry form to see the initial questions.